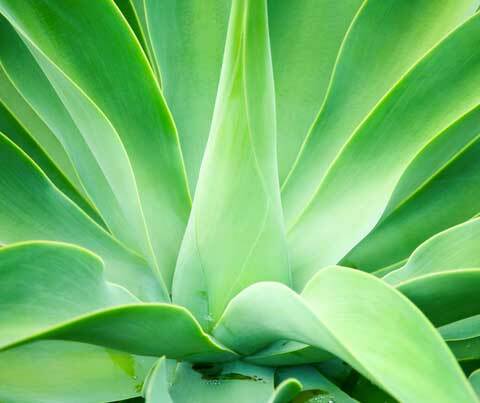 However, a number of articles have also presented agave as a much less desirable sweetener. Coming from trusted alternative-news sources (Andrew Weil, Joseph Mercola, the Weston A. Price Foundation) as well as more conventional sources (the Wall Street Journal, the Los Angeles Times), they present it as highly processed, and critique the high amount of fructose present, likening it to the much-maligned high-fructose corn syrup (HFCS) – perhaps even worse. Let’s start with the basics: what is agave? Agave (sometimes called century plant, and closely related to aloe) is the name of a family of succulent plants native to the southwestern United States, Mexico, and Central America, though it can easily be grown in countries with similar climates (like South Africa). It is closely related to aloe. Traditionally, the plants have been used in a variety of ways. The tough leaves provide a fiber called sisal, used for clothing, shoes, rope, baskets, and similar products. The spines that tip the leaves can be used as needles. Once the leaves are harvested, the heart of the plant (poisonous when raw) can be roasted, as can the flower stalks. The juice in the heart can be boiled down into a sweet syrup, or fermented. Both the juice and syrup had traditional medicinal uses as well. Finally, the stalks, which are light and strong can be used for building or walking sticks. Only one plant in this family is used to make tequila (agave tequilana, sometimes called blue agave); others are used to make another traditional alcoholic beverage called pulque (agave salmiana). Agave nectar can be made from any variety, including agave americana; typically, the nectars labelled “blue agave” are from agave tequilana or americana, and the rest are from agave salmiana. It should be noted that there is only one flower stalk per plant, ever, and it’s produced at the end of the plant’s life – which ranges from 10 to 30 years. OK, so what’s agave nectar? According to Wikipedia, to make a sweet syrup from agave tequilana or americana, the sap must be taken from the core of the flower stalk (or from the root of the mature plant before it starts to grow a stalk), then filtered and heated to separate the polysaccharide inulin into monosaccharides, primarily fructose. Agave salmiana is processed a bit differently; the stalk of the plant produces a liquid called agua miel (honey water); this liquid, when processed, breaks down into the simple sugars fructose and dextrose (a specific form of glucose). Another way to break the liquid into fructose and dextrose is to use enzymes on the sap, then evaporate the resulting liquid to concentrate. Interestingly, one mature agave plant can produce up to 2,500 liters of syrup in a year; once the heart of the plant has been tapped into, and liquid siphoned off, the plant will continue to produce more. The liquid is usually siphoned off twice a day, until the plant will yield no more. For commercial production (whether tequila or agave nectar), the plant is actually not allowed to produce a flower stalk, so that the sap can be taken continuously over time. Is agave just like high-fructose corn syrup? At first look, comparing agave directly with HFCS seems to be a bit of a stretch. To turn starchy, genetically-engineered corn into sweet syrup is a chemical-laden, multi-step, highly industrialized process, using sulfur dioxide, hydrochloric and other acids, isomerase enzymes, heat and pressure to convert glucose to fructose. It’s a completely unnatural process resulting in a completely unnatural sweetener in which the fructose is unbound (meaning it gets absorbed very quickly by the body – see above). When you add the risk of mercury contamination to the mix, avoiding HFCS is just a good idea. But just because it’s not the result of a nightmare chemical process, that doesn’t mean agave nectar gets a pass. Let’s look more closely. It’s a new sweetener. Let’s go back to the early 1990s, because that when we first started seeing this new sweetener on store shelves. That’s right, new – despite its mystique as a traditional sweetener. Agua miel (called miel de agave when boiled down into syrup), is not commercially available in the United States. There is no indigenous or historical tradition of using miel de agave as a sweetener, despite its sweet taste; in fact, it’s most frequently used as a medicine in Mexico. According to this site, the agave plant (and so, its sap) also contains saponins and fructans, phytochemicals associated with antimicrobial, anti-inflammatory and immune-boosting capabilities. (Journal of Ethnopharmacology, 1996; 52:175-7). It was used by the Aztecs as a salve for wounds. It’s super high in fructose. Fruit itself, with fructose as the monosaccharide that makes it sweet, doesn’t have much: a medium peach is roughly 1 percent fructose, all of it bound to the fiber and vitamins also present. Cane sugar is equal parts of fructose and glucose, bound together. High-fructose corn syrup is 55 percent fructose and 45 percent glucose, but the molecules are unbound, making the fructose more of a problem. Agave nectar is typically a whopping 70-90 percent fructose (there are some that go as low as 56 percent, but 90 is more the norm). When you see comments about agave being worse than HFCS, this is the reason; like HFCS, the fructose in agave nectar is unbound – and there’s nearly twice as much. It tends to be a highly processed product. While it is possible to cook agua miel at fairly low temperatures (around 118 degrees) for lengthy periods of time to break the inulin into sugars, most producers cook it at much higher temperatures to break down the carbohydrate into its component sugars, as well as make the liquid syrupy. Here’s a nice diagram showing all the steps gone through to produce agave nectar. Others add enzymes to break down the inulin into fructose and dextrose, then heat the liquid to evaporate it. Some of this last group state “organic enzymes,” but there is not a standard that determines whether an enzyme is organic or not; there are genetically engineered enzymes in the food processing world, as well as enzymes derived from a fungus, Aspergillus niger, which is also used on a larger scale to break down organic waste (the process of using it to create a “fructose syrup” has been patented). Some rumors are just rumors. This applies to both positive rumors and negative ones. For example, some articles critical of agave have mentioned the dangers of a high saponin content in agave nectar, associating it with a risk of miscarriage. However, saponins are found in many plants and parts of plants (clover, oats, lentils, grapes, seeds, to name just a few); they are bitter and toxic to insects. However, they are largely destroyed by cooking, and agave is nothing if not seriously cooked. Another often-quoted inaccuracy is that inulin is a starch like corn, making agave nectar even more like corn syrup; while both inulin and starch are polysaccharides, inulin is not a starch. Want a positive rumor? That fructose is benign simply because it doesn’t cause a spike in blood sugar. Unbound fructose (which enters the body straight away, without requiring digestion) goes straight for the liver (which is why it doesn’t spike blood sugar, by the way). There it is processed and typically stored as triglycerides. It is positively associated with weight gain because unlike other sugars (including bound fructose), it doesn’t shut off hunger when the body has had enough. There are a host of other issues associated with taking in a lot of fructose, including the potential for non-alcoholic fatty liver disease, bloating, and mineral depletion. So does agave nectar belong in my cupboard at all? I don’t have it in mine, but it’s really up to you. There are certainly plenty of other sweeteners to use for those times when you want to make a dessert, or sweeten your tea, and they’ve been around and used by us humans for a long time. The first of these is honey. When unheated (not heated to a temperature higher than that found inside the hive on a sunny day), it’s got lots of enzymes, too. Another is whole cane sugar (like Sucanat), which at least has (admittedly tiny) traces of minerals (calcium, magnesium, even B vitamins) because the molasses is left in. Organic maple syrup is a traditional sweetener with traces of zinc and manganese in it; it is similar in composition to cane sugar (sucrose + glucose in more or less equal amounts). Less common options include stevia, yacon syrup, palm sugar, and coconut sugar. With all those choices – none of them with the super-high levels of fructose of agave, why even bother? On the other hand, if you really, really crave an occasional squeeze of the stuff to add to your tea, and aren’t using it for a whole lot of other uses – and your health is good and supported by a nutrient-dense diet – it’s not going to kill you. Just don’t be fooled into thinking that it’s one of the healthiest sweeteners on the block, just because the marketing hype got to you. This entry was posted in Nutrition and tagged agave, agave nectar, fructose, HFCS, inulin by Blochster. Bookmark the permalink.